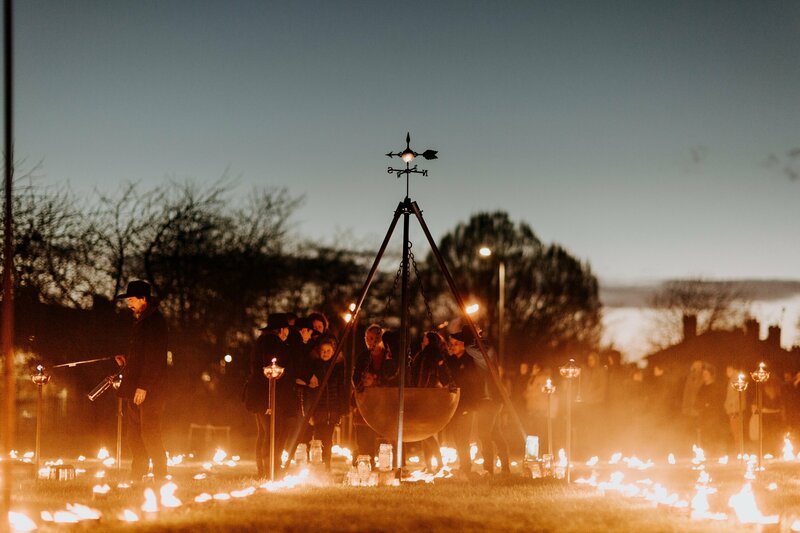 As dusk falls over East Park each night from 3 until 5 May 2019, and again in Birkenhead Park in Wirral from 17 until 19 May 2019, visitors will step into The Witching Hour, Absolutely Cultured and Wirral Borough of Culture 2019’s spring co-commission. The Witching Hour will inspire imagination and celebrate local tales, memories and folklore, exploring stories of local wise women, magical mythical characters and childhood memories from these two places on opposite sides of the country. The Witching Hour will immerse audiences in a unique and shared experience, weaving a story between the two locations. Building on Hull 2017’s immensely successful Land of Green Ginger project, this large-scale, outdoor, immersive performance, by renowned theatre company Periplum, has invited residents from each location to share their stories, memories and urban myths. Although the main story of The Witching Hour remains the same in both locations, the performances will resonate directly with the two communities through the inclusion of local tales that will be woven into the narrative. Lucy Barrow, Assistant Director for Culture and Visitor Economy at Wirral Council, commented: “The Witching Hour promises to be a highlight of our year as Borough of Culture for Liverpool City Region. We are massively excited to have this extraordinary production taking place in the stunning setting of Birkenhead Park, which will be transformed into an even more spectacular wonderland for this new show. As audiences enter they will be spellbound by spinning tales of alchemy and legend from the two parks. Featuring live performance, a specially commissioned soundtrack, pyrotechnics and promenading action taking place in and around the audience, The Witching Hour explores local legend and folklore from East Park in Hull and Birkenhead Park in Wirral. Katy Fuller, Chief Executive and Creative Director of Absolutely Cultured, said: “We’re looking forward to welcoming people to the curious and magical world of The Witching Hour and telling these stories that have come directly from the communities themselves. “As the sun sets and anticipation rises, a little bit of magic will take visitors on a special journey. Is there more to those tricks of the light, shadows and fleeting images glimpsed from the corner of your eye when the witching hour of dusk is upon us! “Building on the learning from Land of Green Ginger we wanted The Witching Hour to create something magical for these communities, giving them a unique and unforgettable experience. In 2019, whilst Absolutely Cultured continues to build on the success of Hull UK City of Culture 2017, Wirral became Liverpool City Region’s 2019 Borough of Culture. Absolutely Cultured is committed to drawing on its experience to work with other locations to co-commissions projects with shared aims. By working in partnership, the legacy of the UK City of Culture programme, and particularly Hull’s successes in attracting a very broad audience to cultural events, can be shared across the country. The Witching Hour received a National Lottery Heritage Fund grant of £100,000 to help deliver this exciting project. Made possible by money raised by National Lottery players, the project will capture the stories and legends passed on through generations in two areas of the country. The Witching Hour is a free and unticketed event. Performances in Hull will begin at 9.30pm and at 9.45pm in Wirral. The show will last approximately one hour. For further information about The Witching Hour, follow us on social media and visit our event page.